Every day, jazz enlivens the Jardin Nelson! At the Jardin Nelson, the weather is always perfect! Thanks to our retractable awnings, parasols and pergolas, your comfort is assured. 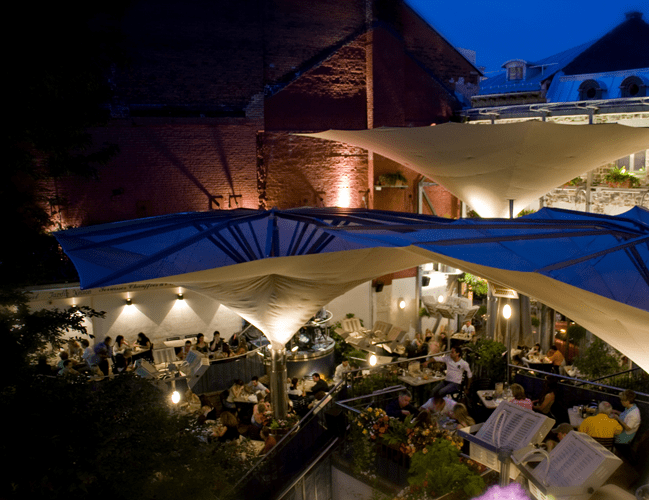 Even if it rains sometimes, our giant parasols cover our terraces so that you can continue your meal in perfect comfort. Our clients tell us that they find the Jardin Nelson particularly romantic when it rains. Our clients are always protected from bad weather, able to enjoy a hot drink and rhythmic jazz. On days when the sun is at its fiercest, the Jardin Nelson deploys its parasols so that our clients may be shaded. For those who prefer the sun, the front terrace with its retractable roof lets the sun’s rays warm you. Fearing the cold when Mother Nature plays its tricks? Even if the mercury falls, the Jardin Nelson has a high tech electric infra-red heating system to insure your comfort in all weather. Gilbert Joanis has been part of the musical tradition at the Jardin Nelson since many years. Passionate for music, he selects a popular jazz repertoire much appreciated by our clientele. He knows how to choose and direct his musicians so that your time at the Jardin Nelson is always unique and charming. Sympathetic and very professional, Gilbert Joanis has an impressive musical background. In addition to his participation in the Cirque du Soleil‘s North American tour, he has accompanied many artists: Adamo, Sylvain Cossette, Murray Head, André Gagnon, Patsy Gallant, Ima, Eric Lapointe, Jean Lapointe, Nancy Martinez, Toulouse, Dawn Tyler-Watson, Roch Voisine, etc. Gilbert Joanis is enthusiastic about all styles of music but his heart and his real passion is jazz. A graduate from the University of Montreal in the jazz singing interpretation program, Elodie Miron is a passionate performer. She currently sings in different groups, performs as a soloist, and as a backup vocalist for many headlining artists. 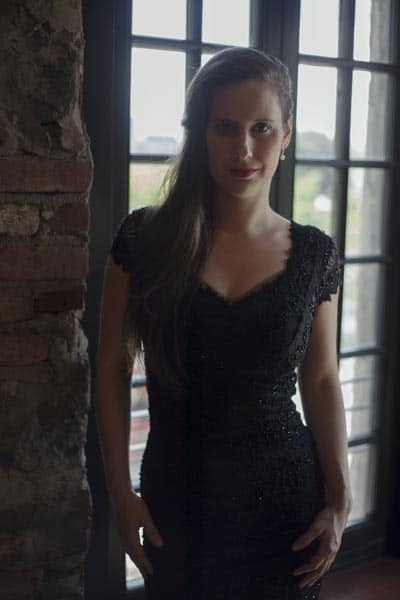 In the last few years, she has performed in Quebec, the United States, France, and Mexico, offering original arrangements and a large repertoire of popular songs. With her warm voice and contagious smile, Elodie will thrill you every Sunday to the sound of your favorite jazz-pop melodies. As soon as you enter the courtyard, you will be amazed by the floral arrangements in a variety of colors complementing the building’s architecture. Our gardeners have created a magnificent decor with a variety of flowers and bushes arrayed in a spectacular presentation. Birds sing. It’s nature in the heart of Old Montreal. A must see! We wish to thank the gardeners who take care of the Jardin all season long; they are part of the Jardinzurbains wonderful crew.